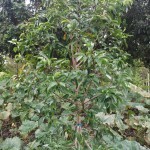 Tropical Fruit – A Tasty Survey, Part X - Richard Lyons Nursery, Inc.
We continue our survey of interesting edible tropical plants that can be grown in southern Florida. 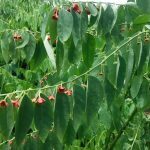 Surely something named Sauropus androgynus has to be a newly-discovered dinosaur species, but, in fact, it is a very tasty edible shrub. In southern and southeastern Asia it is among the most popular of leafy vegetables. Also known as star gooseberry among English-speakers, this plant produces multiple upright stems and matures to a height of 6-12 ft., although when grown commercially it is kept pruned back. Katuk is yet another plant whose widespread use has obscured its original home; some authorities say Borneo, and others say India. What makes it so desirable is that practically all of the plant can be eaten, either raw or cooked. Shoot tips are sold as tropical asparagus. In some areas, S.androgynus is incorporated into soups along with various kinds of meat. It is also commonly used raw in salads and stir-fried with other vegetable. androgynus is a farmer’s favorite because it is a high-yield crop. For consumers it has excellent nutritional value. It contains significant levels of Vitamins A (via carotenoids), B, and C. It is also rich in nutrients and protein, and it is said to possess medicinal qualities. Katuk is also an attractive ornamental. 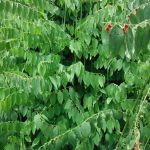 It features blue-green oblong leaves, and its clumping habit makes it useful as a screening material. The species’ small white-and-magenta flowers form along leafstems and give way to white-to-pinkish fruits about the size of marbles. S. androgynus appreciates ample moisture, but also has some drought tolerance once established in the ground. It should be planted in well-drained soil. In a hot, humid climate like that of southern Florida, it performs best when grown in light shade. It grows very rapidly during the summer, but slows down significantly in cool, dry weather. It has low frost and salt air tolerance, but is not known to have significant pest or disease problems. Richard Lyons’ Nursery is currently propagating this excellent food source. The soursop is yet another plant whose place of origin within the New World tropics cannot be pinpointed because its use has spread greatly over the centuries. It is known in Spanish-speaking countries as guanábana and in Portuguese-speaking countries as graviola, but a host of other common names has been attached to it as it has spread around the tropics. It was among the earliest fruit trees to be taken to the Old World tropics. It has probably been grown in Florida for more than a hundred years. Muricata stands out from the 60 or so other species of Annona by producing the largest fruit in the genus. The tree matures in the 25-30 ft. range, with a low-branching growth habit. 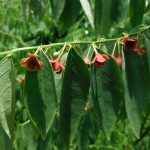 This species has an unusual flowering habit: Blooms occur singly, but can appear anywhere on the tree. They are a pale yellow color at the throat, but become yellow-green in the outer petals. The warty-skinned fruit is not very regular in form, but is generally heart-shaped or oval, maturing to somewhere between 4 and 12 in. long. Depending on the cultivar, as well as growing conditions, they can weigh 2-15 lbs. Dark green while developing, the fruit turns somewhat yellow at maturity, at which point the ‘warts’ can be broken off easily. Ideally, fruit should be picked from the tree just as it begins to soften, because it can be bruised or otherwise damaged upon falling to the ground. Soursop pulp smells a bit like pineapple, but it has a very specific acid to subacid taste. In addition to being eaten out of hand, guanábana is also processed for juice, and in some places unripe fruit is cooked, fried or roasted as a vegetable. Because of its moderate size, A. muricata is a good fit for most home gardens. It performs well in our limestone soils. A steady source of moisture, as well as good drainage, is important. Young trees should be given some protection from outbursts of cold weather. 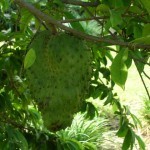 Soursop has long had a role in folk medicine. Some aficionados believe that a tea brewed from the leaves plays a role in treating cancer. At least one study has shown that the soursop tea can successfully treat drug-resistant cancer cells in laboratory media, but this claim appears not to have been replicated in humans. Richard Lyons’ Nursery carries A. muricata is 3- and 7-gal. containers.